In order to make good use of Akatsuki, JAXA is planning to make it observe asteroids around Venus. They say we don't have any data about asteroid whose orbit is nearer the sun. If Akatsuki made it, that would be a great feat. A lot of asteroids are between Mars and Jupiter. NASA's Galileo, ESA's Rosetta and JAXA's Hayabusa have all observed asteroids which are out of the earth's orbit. 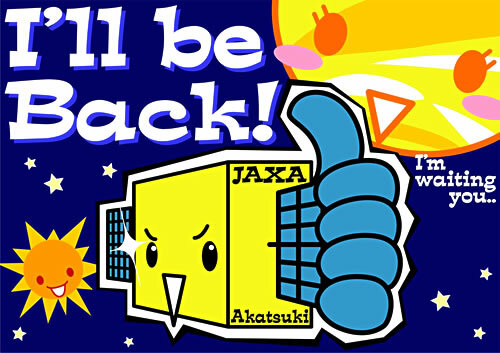 JAXA says there's a possibility that Akatsuki could observe two of asteroids around Venus. They're planning to calculate how much they have to adjust Akatsuki's orbit to approach to the asteroids, and after that, how to approach to Venus. They say they'd like to analyze the asteroids' constituent by making Akatsuki take some pics flying by the asteroids. Akatsuki's propulsion is now down to about 70% [of its former capability]. And in 2016 Akatsuki may run short of fuel, besides, in 2016,its observation machinery will be beyond its life span. Even if they could make Akatsuki insert the orbit in 2016 (or 2017), there's only a little hope that it could observe Venus as we expected. By the time Akatsuki meets Venus, it will have circled the sun 11 times, while Venus circles 10 times. A day later, the Mainichi Daily News reported (in English) that "JAXA may make second try at Akatsuki-Venus rendezvous one year earlier than planned." It explains that the damaged engine nozzle may not permit orbit entry during the 2016 encounter, but if they use smaller engine burns to slowly decelerate Akatsuki over the intervening time they could both move up the orbit insertion date to 2015 and decrease the amount of delta-vee required to get Akatsuki into orbit. It's not clear to me whether both are possible, or if they are mutually exclusive. I'm a bit suspicious about the fact that the first story mentions no specific asteroid targets. Space is very empty; the Akatsuki team would have to be very fortunate to find an asteroid near enough to their predicted path to rendezvous with it, though of course they have a lot of time to work with as well as enough fuel to get a spacecraft into orbit, which is, well, a lot of fuel. So they may be able to make big orbit changes to make a flyby happen. But the more fuel they burn for a flyby, the less they'd have for another attempt at orbit insertion at Venus.